McDowell Cave (23BY2) was excavated and published by Lee M. Adams, an amateur archaeologist and trustee of the Missouri Archaeological Society. His research at the cave was published during 1958 in the Missouri Archaeologist 20:102-8. This site is situated on private property and it is not open to the public. The stone tools that Adams uncovered at Rock House Cave are typical of the Archaic Period (7000 - 1000 BC) and Woodland Period (1000 BC - AD 900) in the Ozarks region of Missouri. Adams (1941:26) reported that 2 grit tempered pottery sherds (typical of the Late Woodland Period = AD 700 - 900) and 9 shell tempered pottery sherds (typical of the Mississippi Period = AD 900 - 1400) were excavated from McDowell Cave. The presence of metal projectile points indicate that the site was occupied during the Historic Period. 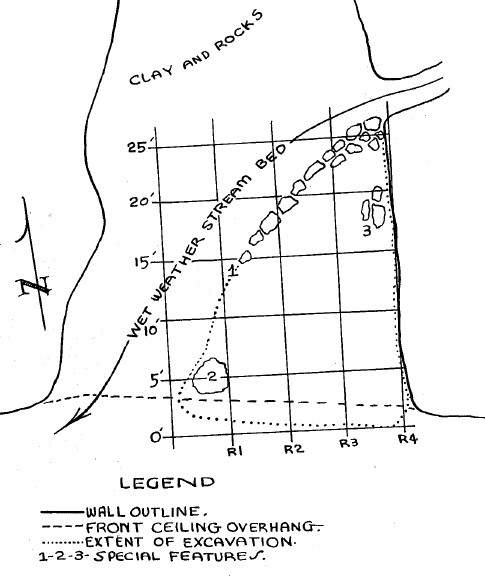 Plan of McDowell Cave published by Adams (1958:Figure 52). Adams made careful plans, controlled his excavation by a grid system, and published his results; his work is praiseworthy. Profile of McDowell Cave published by Adams (1958:Figure 53). 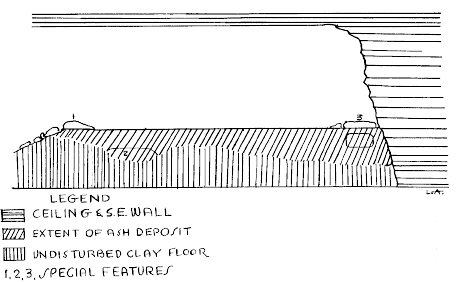 Profile of Rock House cave published by Adams (1941:Figure 53). 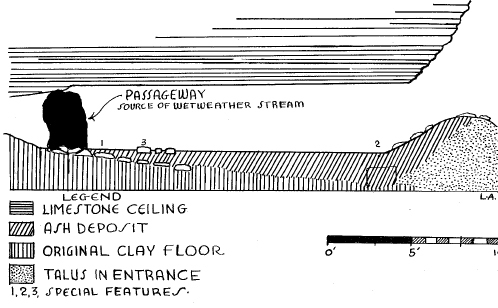 Cultural material from McDowell cave (23BY2) and published by Adams (1941:Figure 54). 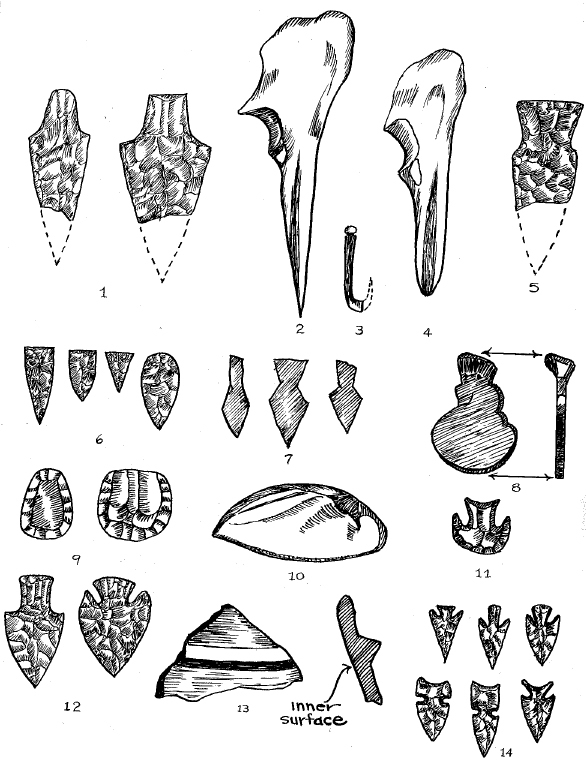 1 - Contracting stemmed projectile point (Langtry), 2 - bone awl, 3 - bone fishhook, 4 - bone punch, 5 - Swallow side notched projectile point (Rice Side Notched), 6 - Triangular arrowpoints (three Madison points and a Crisp Ovate point), 7 - copper arrowheads, 8 - brass gun decoration, 9 - thumb scapers, 10 - shell scraper or spoon, 11 - projectile point reworked into a scraper, 12 - stemmed/corner notched points, 13 - potter sherd no. 9, 14 - arrowpoints (Scallorn points and Reed points).